Rummage through the pantry or freezer and you're likely to find some of the ingredients the Environmental Protection Agency is now deploying to clean up graffiti. Glass, dry ice and a form of soy oil are among the items the EPA has paid the Institute for Research and Technical Assistance to test as non-toxic solvents that are safe for humans and the environment. The Institute, based in Los Angeles, is a non-profit that researches alternatives for hazardous chemicals, in particular solvents. Each year the San Francisco Department of Public Works receives some 30,000 phone calls about graffiti vandalism, according to director Mohammed Nuru. The city spends $20 million annually on graffiti removal, much of it done by volunteers who must be protected from the toxic fumes in traditional solvents. 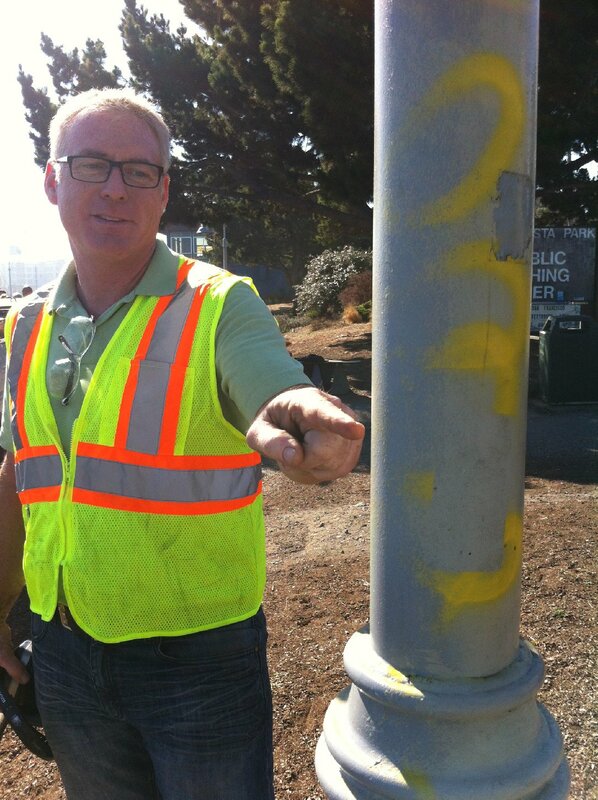 Ben Shepard points to a pole where graffiti was removed by high-pressure sand. 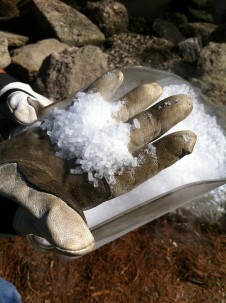 Shephard is with Cold Jet, a company that manufactures high pressure blasters for use with sand and dry ice. “In some cases you have to wear a mask and suit up,” Nuru said. “We’re looking for solvents that have fewer chemicals." Chemicals like N-methyl pyrrolidone and toluene are renowned for their ability to dissolve paint. But the properties that make them effective solvents also make them harmful to people and the environment. NMP and toluene are listed under California’s Proposition 65 as chemicals known to cause developmental harm. Toluene is also listed as a hazardous air pollutant under the federal Clean Air Act. The Department has spent the past three years trying new solutions with everything from baking soda to dry ice, and Nuru said they’re focused on eliminating as many types of harmful chemical solvents as possible. Dry ice is the solid form of carbon dioxide. Small pellets of ice are pressure-blasted onto surfaces where they freeze the graffiti, causing it to expand and explode off the surface of a bus or building. After hitting a structure the dry ice turns into a gas and returns into the atmosphere as carbon dioxide, leaving no residue behind. The amount of CO2 is negligible, according to Ben Shepard of Cold Jet, which manufactures a high pressure blaster for dry ice. Dry ice pellets are blasted onto surfaces, freezing graffiti that then expands and explodes off city buildings. San Francisco will also be testing sand and a soy-oil product. The soy contains methyl ester, a compound in vegetable oils that can remove certain types of paint. It’s mixed with rubbing alcohol and can be wiped onto surfaces without a heavy duty sand blaster. The sand is made from old beer bottles and other recycled glass that is ground into a fine powder that is pressure-blasted onto graffiti to scrape it away. Peanut oil was an early contender since it removes spray paint from stop signs the way peanut butter removes gum from hair. But the prevalence of nut allergies among many people squashed that solution. For all their novelty, the natural materials can’t dissolve the graffiti itself. The tiny bits of paint that are blasted or wiped off may still contain harmful chemicals.